THE battle for the control of supermarket chain, Choppies Zimbabwe, pitting former vice-president Phelekezela Mphoko’s family and its foreign business partners has taken a nasty turn after the Botswana investors barred workers from talking to the politician. The boardroom war has spilled into the High Court with the Botswana-headquartered company seeking to bar the Mphoko family from interfering with operations of the business. The letter, dated November 19, came after Mphoko and his son Siqokoqela met Choppies employees at the company’s Bulawayo headquarters that morning to hear their grievances ranging from poor pay, sexual harassment, to unfair dismissal and racial attacks by their Indian managers. 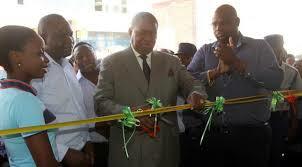 “Kindly note that Mr P Mphoko and Mr S Mphoko do not have a financial or operational say in the business of Nanavac. We strongly request that all employees desist from dealing with the above-mentioned persons with immediate effect,” Ramachandran wrote in the memo. Mphoko argues his business partners want to take advantage of his political situation since he was fired from government and the ruling Zanu PF party. The High Court is yet to make a ruling on the ownership dispute. Mphoko’s lawyer, Welshman Ncube, told The Standard on Friday that the Botswana-based Choppies CEO was offside in saying the ex-VP had no financial or operational say in the running of the business. Choppies human resources manager Sipho Mpofu yesterday said he was on leave and could not comment while Ramachandran could not be reached for comment. Meanwhile, Ramachandran’s memo has angered the Choppies national workers’ committee and their representative trade union, Commercial Workers’ Union of Zimbabwe (CWUZ). This is amid workers’ claims of sexual harassment of female staff, unfair dismissals, low pay and racial attacks where some black employees are allegedly even called baboons by their managers of Indian origin. Malinga on Friday said the workers’ committee wanted the directors to stop harassing employees in their boardroom war with the Mphokos, adding “as far as we are concerned, we know the Mphokos have 51% shareholding”. The CWUZ weighed in with a statement: “We will not, as a trade union, tolerate that behaviour. The employees have a right to approach the Mphokos until the ownership dispute is resolved.